A retarder is a driver activated auxiliary braking system which operates independently of the service brakes, engine and gearbox. 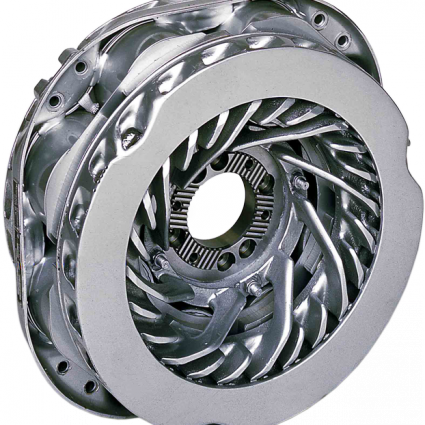 It applies a retarding force through the driving wheels and is rated for continuous use, without loss of efficiency. The vehicle must be fully loaded. The service, emergency & parking brakes may not be applied during the test. The gear selected must be such that the engine speed does not exceed the maximum RPM stipulated in the engine manufacturer’s specifications. WHAT IS A TELMA RETARDER? A TELMA Electro-magnetic Retarder is an assembly of electro magnetic coils which, when activated by an electrical current, creates eddy ( Foucault ) currents between two rotors and a stator and retards the movement of the rotor. 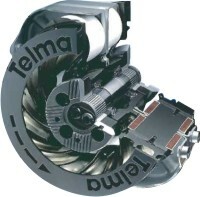 Fitted into the driveline of a vehicle the Telma retarder acts directly on the driven wheels and reduces the speed of a vehicle. Telma retarders are frictionless and virtually maintenance free. Telma retarders are manufactured in France. In most European countries, retarders are mandatory fitment for buses, coaches and some heavy transport vehicles because they significantly improve the safety of these vehicles. The energy created in the operation of a Telma retarder is converted into heat. Correctly applied, however, this temperature build up will be dissipated through efficient heat sinks on the retarder and no loss of efficiency will occur. The retarder can be activated by switches fitted to the accelerator and the clutch and by a hand-operated lever mounted to the steering column or the dashboard. Telma retarders can be retrofitted to a vehicle, however, fitment is simpler if carried out before bodywork is fitted. The electromagnetic technology guarantees unequalled instantaneous availability and full braking power provided by the Telma retarder, regardless of the vehicle’s speed. Telma retarders remain effective even after the engine stops, or when the gearbox is in neutral. As they dissipate the energy generated during braking directly into the atmosphere without using the engine’s liquid cooling system, Telma retarders are effective in all situations, thereby ensuring that a vehicle always remains at the driver’s desired speed. 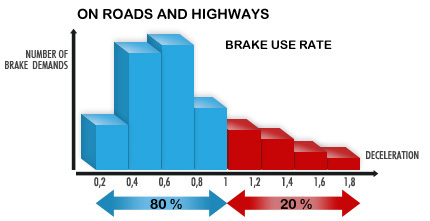 With exceptional endurance, Telma retarders ensure most vehicles’ braking needs. 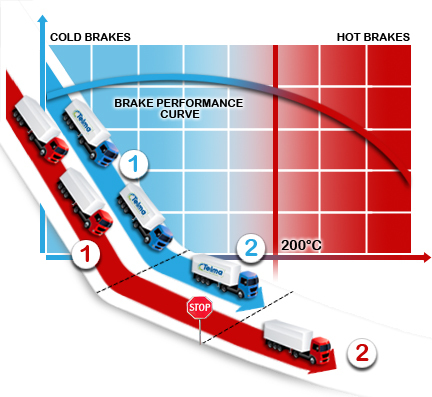 Risks associated with service braking system overheating are therefore avoided and the system remains fully operational in case of emergency. The complete lack of friction makes Telma retarders totally silent in all conditions of use. The electromagnetic technology guarantees Telma retarders’ instant response to driver solicitations, thus allowing for an unprecedented driving experience. The ease of use, flexibility and progressive character of Telma retarders guarantees exceptional comfort for the driver and its passengers. Telma retarders also provide great adaptability due to the wide range of products offered, the simplicity of integration and the compatibility with all electronic braking systems available on the market. With their tried and robust technology, Telma retarders require no specific maintenance. The complete lack of friction makes Telma retarders totally silent in all conditions of use. The electromagnetic technology guarantees Telma retarders’ instant response to driver solicitations, thus allowing for an unprecedented driving experience. The ease of use, flexibility and progressive character of Telma retarders guarantees exceptional comfort for the driver and its passengers. Telma retarders also provide great adaptability due to the wide range of products offered, the simplicity of integration and the compatibility with all electronic braking systems available on the market. With their tried and robust technology, Telma retarders require no specific maintenance. The exceptional reactivity of Telma retarders prevents excessive fuel consumption during fast switches between deceleration and acceleration phases. 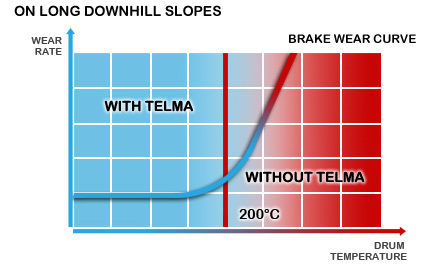 Telma retarders never go against the engine: they can instantly stop producing braking torque upon driver’s request. The recognized quality, reliability and durability of Telma retarders make them a profitable investment that quickly pays for itself and, by extending the vehicle’s braking ability, they increase the average operational speed. Telma retarders comply with the European ROHS directive (2002/95/CE) restricting the use of certain hazardous substances in the construction of electrical equipment. The total lack of friction makes Telma retarders fully silent under all conditions of use and guarantees the absence of particle emissions or any other pollutant release into the environment. Telma retarders are maintenance-free and do not require any fluid change or wearing parts replacement. As they comply with the European directive 2004/108/EC on electromagnetic compatibility (EMC), Telma retarders present no electromagnetic incompatibility with the environment. Finally, the contribution of Telma retarders to the reduction of the equipped vehicles’ energy consumption actively contributes to the reduction of greenhouse gas emissions. The Telma retarder offers unique passenger or transport vehicle performance in terms of comfort, safety, savings, and environment. This device ensures unparalleled performances in all vehicles, including the most recent. The unique characteristics of Telma retarders ensure outstanding results in numerous industrial applications.